Seeding: EKO Top Dressing is recommended for this application. Established Lawns: EKO Top Dressing is recommended for this application. Mix Earth Essentials Sheep, Peat & Compost thoroughly into your existing soil at a ratio of 1 package Earth Essentials Sheep, Peat & Compost per 10 square feet of area. 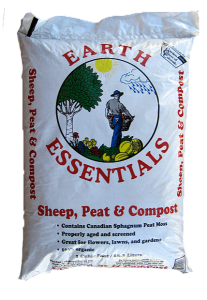 Earth Essentials Sheep, Peat & Compost will slowly release nutrients to your plants. Earth Essentials Sheep, Peat & Compost is a premium mix. It contains sheep manure as a source of fertilizer, peat moss for moisture retention, and compost for improved soil structure, added moisture retention, nutrient value, and a source of micro-organisms. Earth Essentials Sheep, Peat & Compost is a thoroughly composted product, which helps eliminate weed seeds and other pathogens that may be present in raw manures. The Richlawn Company encourages you to open a bag of our Earth Essentials products, and compare them to any similar products available. We are confident that you will find these products to be the best available.